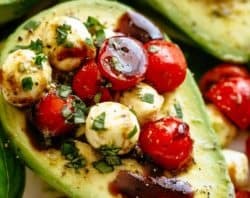 Caprese salad with creamy avocado slices is so easy to make! The best salad to add to your dinner table. 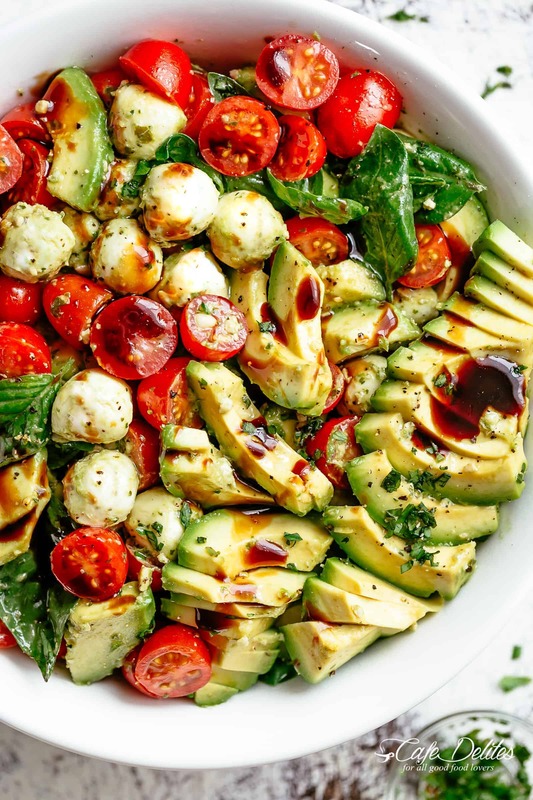 Classic Caprese flavour combination of tomato, fresh mozzarella and basil, with an optional balsamic reduction gets a creamy addition with this Avocado Caprese Salad recipe! 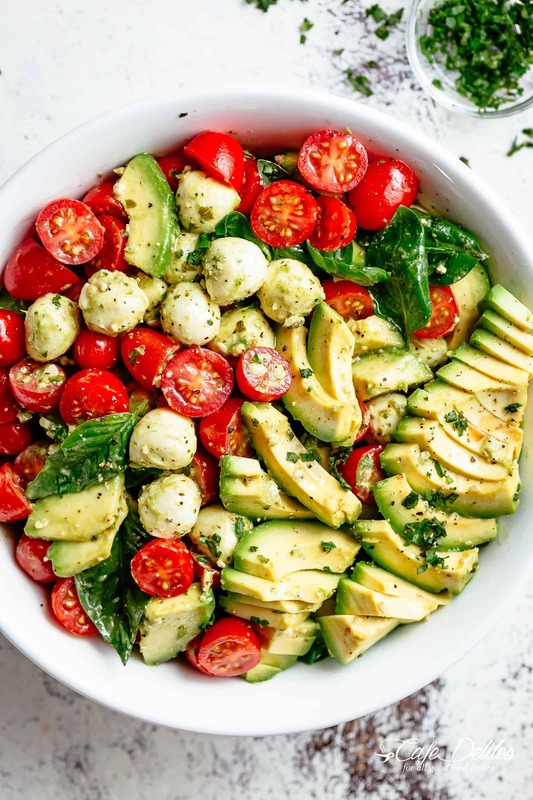 Add in the optional fresh basil pesto and garlic for added flavour and this favourite and popular summertime salad is THE most refreshing salad for your dinner table! 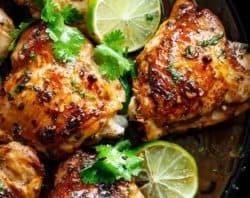 OR make it into a main and serve it with chicken! Something like this Caprese Chicken Avocado Salad. There’s really nothing like a classic Caprese salad…but when adding avocado, you quickly realise that was the one thing missing in Caprese! All the fresh flavours together drizzled with a slightly sweet and tangy balsamic glaze just takes it to a whole other level. We added our own slight twist to the classic salad by using bursting-with-flavour grape or cherry tomatoes and baby mozzarella (bocconcini) balls. Toss with fresh basil leaves, avocado, and homemade basil pesto for an epic flavour combination, and your heart will sing. Traditionally, Caprese salad does not include a balsamic reduction or glaze. 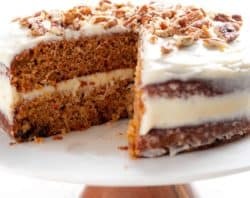 For the American/Australian version however, I’ve included it in the recipe should you wish to add it in. 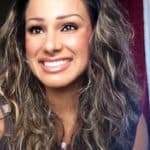 Personally, I love both with and without! Fresh mozzarella is used in a classic Caprese. You can also use Burrata cheese for an even creamier salad! Of course, the first wine I’d recommend is a chilled glass of Rosé. Feel free to choose any from the following list! Love Caprese? 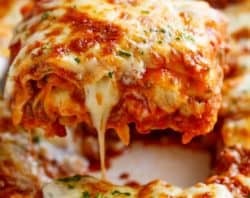 Try these recipes with a Caprese twist! How about Caprese Stuffed Avocado? 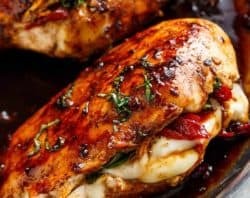 Or Caprese Stuffed Balsamic Chicken! 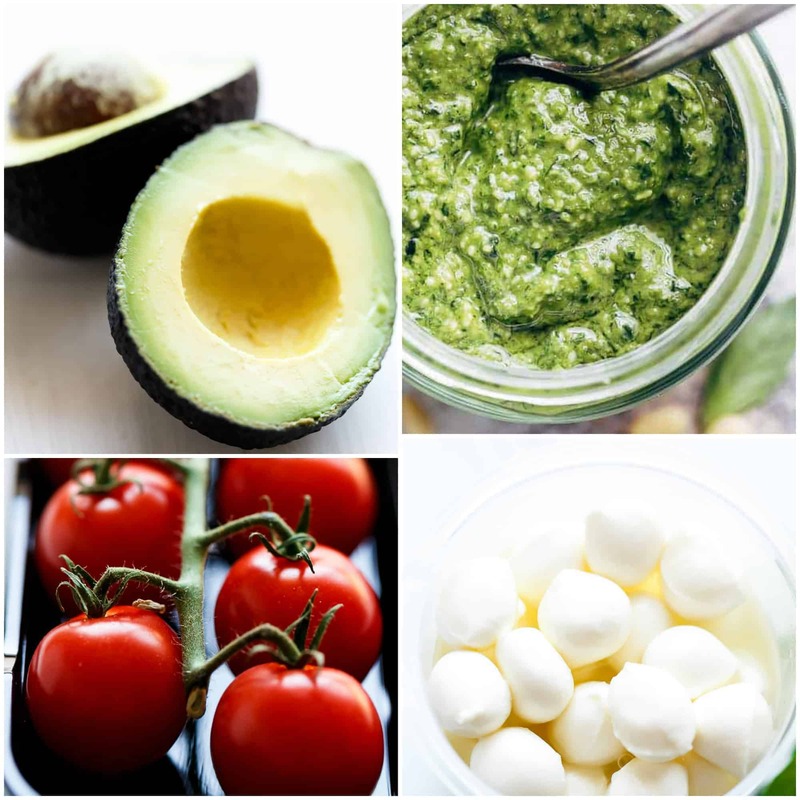 Caprese salad with creamy avocado slices is so easy to make! 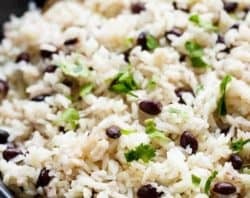 The best salad to add to your dinner table. 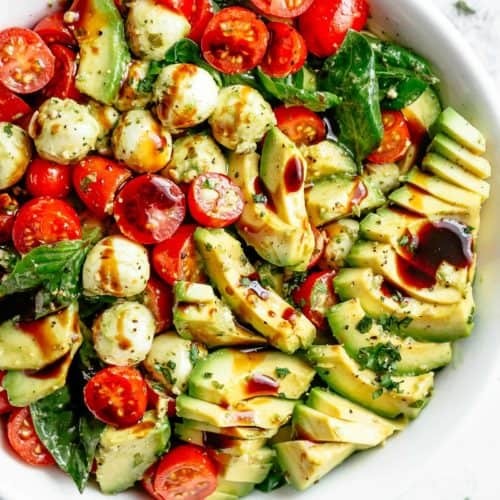 The classic Caprese flavour combination of tomato, fresh mozzarella and basil, with an optional balsamic reduction gets a creamy addition with avocado and a delicious basil pesto dressing! 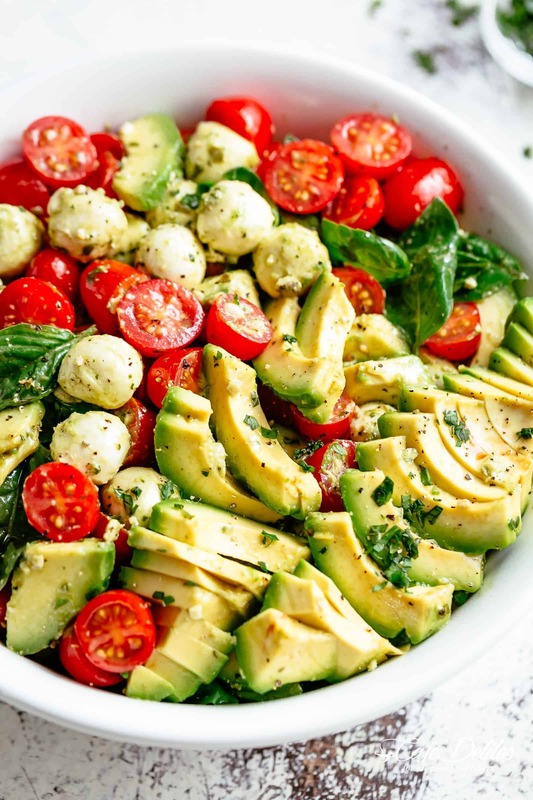 In a salad bowl, combine tomatoes, mozzarella balls, pesto, garlic, olive oil, salt and pepper in a bowl; mix well to evenly coat in the dressing. Toss with the avocados and basil leaves. Drizzle with balsamic glaze, if using. Taste test and add more salt/pepper, if needed. Serve immediately. For The Balsamic Reduction: Combine 1/2 cup balsamic vinegar and 1 tablespoon of light brown sugar together in a small saucepan and bring to a simmer over medium-high heat, stirring occasionally. Reduce heat to low and simmer gently until the vinegar has reduced by half and has thickened to a syrup-like consistency (about 8 minutes). Allow to cool.